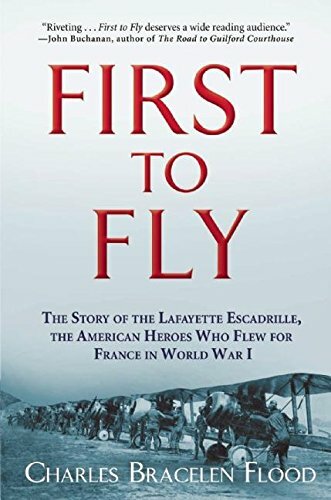 First to Fly: The Story of the Lafayette Escadrille, the American Heroes Who Flew For France in World War I est le grand livre que vous voulez. Ce beau livre est créé par Charles Bracelen Flood. En fait, le livre a 256 pages. The First to Fly: The Story of the Lafayette Escadrille, the American Heroes Who Flew For France in World War I est libéré par la fabrication de Atlantic Monthly Press. Vous pouvez consulter en ligne avec First to Fly: The Story of the Lafayette Escadrille, the American Heroes Who Flew For France in World War I étape facile. Toutefois, si vous désirez garder pour ordinateur portable, vous pouvez First to Fly: The Story of the Lafayette Escadrille, the American Heroes Who Flew For France in World War I sauver maintenant. If the Wright brothers’ 1903 flights in Kitty Hawk marked the birth of aviation, World War I can be called its violent adolescencea brief but bloody era that completely changed the way planes were designed, fabricated, and flown. The war forged an industry that would redefine transportation and warfare for future generations. In First to Fly, lauded historian Charles Bracelen Flood tells the story of the men who were at the forefront of that revolution: the daredevil Americans of the Lafayette Escadrille, who flew in French planes, wore French uniforms, and showed the world an American brand of heroism before the United States entered the Great War. As citizens of a neutral nation from 1914 to early 1917, Americans were prohibited from serving in a foreign army, but many brave young souls soon made their way into European battle zones: as ambulance drivers, nurses, and more dangerously, as soldiers in the French Foreign Legion. It was partly from the ranks of the latter group, and with the sponsorship of an expat American surgeon and a Vanderbilt, that the Lafayette Escadrille was formed in 1916 as the first and only all-American squadron in the French Air Service. Flying rudimentary planes, against one-in-three odds of being killed, these fearless young men gathered reconnaissance and shot down enemy aircraft, participated in the Battle of Verdun and faced off with the Red Baron, dueling across the war-torn skies like modern knights on horseback. Drawing on rarely seen primary sources, Flood chronicles the startling success of that intrepid band, and gives a compelling look at the rise of aviation and a new era of warfare.